A Couple of Ladies Visit "The Odd Couple"
Christine holds bachelor’s and master’s degrees in Music and continues to apply her voice to all genres of music. An arts lover since childhood, she currently works as a freelance writer. The winter gear is packed away. The sun is shining. And the beach is just a drive away. 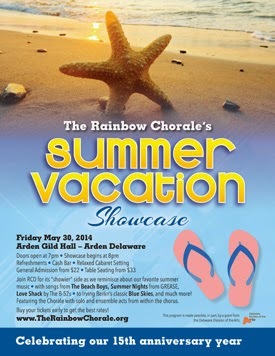 Summer is a-comin’ in, and The Rainbow Chorale of Delaware welcomed the season on June 30 at the Arden Gild Hall with a program that swept away any lingering memories of the winter we thought would never end. There was something for everyone in this concert — and that’s before mentioning the raffle, the food and the goodies for sale. What better way to start the program than with a medley of summer anthems from the Beach Boys. The ensemble had Fun, Fun, Fun with In My Room and California Girls (or Guys, depending). Delaware Baby Boomers probably recalled the first time they heard those tunes played on the radio station of their youth: 1380 WAMS. Fans of Disney’s Oscar-winning animated film Frozen got treated to a performance of In Summer, as “Olaf” merrily danced along, eagerly anticipating summer but blissfully ignorant as to what the heat had in store for him. Denise Conner, Evan M. Malin, Chris Phelan and Barbara Williams extolled the powers of strychnine and cyanide, ably demonstrating the black humor in Tom Lehrer’s Poisoning Pigeons in the Park. The imagery in the Tepper-Bennett penned Summer Sounds was rendered all the more nostalgic by the a capella quartet of Tony Adubato, Michael A. Bareham, Anthony M. Condoluci and Michael Hovendick. Their voices were smooth and melodic, and blended remarkably well. The mood got a bit more serious when sopranos Anne Shuman Urban and Cynthia E. Robinson stepped into the spotlight for their solos. Shuman Urban applied her crystalline voice and expansive range to Gershwin’s Summertime, while Robinson delivered a powerful interpretation of Summer Me, Winter Me. The ‘60s were again represented with selections like Under the Boardwalk, Those Lazy, Hazy Crazy Days of Summer and Dancing in the Street. And what summer concert would be complete without a performance of Alan Sherman’s classic, Hello Muddah, Hello Fadduh? This one did not disappoint! Yanaka Bernal assumed the role of the jilted lover in her rendition of Runaround Sue. Her loyal and faithful friends offered support and backup vocals, until “Sue” in the person of Robinson strutted by taking one as conquest. The Great American Songbook got its due with a performance of Irving Berlin’s Blue Skies. Spirited performances of Summer Nights from the legendary Grease soundtrack and the B-52's Love Shack rounded out the program. Collaborative pianist Andre Vermeulen capably handled accompanist duties and revealed talents on the accordion as well. The Chorale’s volunteer coordinator, Josh Yoder, served as “lifeguard/emcee,” sauntering onstage between selections, bantering with the audience and reading with utmost expression water-safety tips from the American Red Cross and The Onion—while never passing up the opportunity to supply a well-placed double entendre or observation. Delaware Art Museum Calls for Artists!